At Gear4music.com we update our news channel daily to ensure you always get the latest and most important music news. Looking to get started in music? You've found the right place. Native Instruments' newest additions are the perfect tools to kick start your creativity. Read more in our 2019 roundup guide. Music production has never been more popular. Bedroom producers can now produce smash hits and there is an incredible range of gear on offer for ambitious new-comers to the scene. Native Instruments' new gear for 2019 provides the perfect starting point for your musical journey. New software, audio interfaces, MIDI controllers, and online resources make joining the Native Instruments ecosystem more accessible than ever. The best thing is, once you've got started with your first piece of Native Instruments hardware and software, you'll be joining the same family of products used by the world's leading artists and producers. Whether you're a DJ, producer, musician, songwriter, podcaster, vlogger, or performer, you'll find exactly what you need to inspire your creativity. Read more and find out what's new for 2019 in the Native Instruments family. When you're producing music, you need sounds that inspire. Komplete Start is the free software suite of sounds that will kick start your producing journey. With 15 instruments, 2 effects, and over 1,500 sounds from the most popular Expansion Packs, Komplete Start has everything you need to make professional tracks. Komplete Start comes supplied free with many Native Instruments products, meaning you can get making music, right out the box. Best of all, once you've got started with the premium sounds in Komplete Start, you'll be perfectly acquainted with the Native Instruments Komplete family. The next step is discovering the different versions of Komplete 12, featuring up to 900 GB of content and over 90,000 sounds in its most expansive edition! Plug in your microphone or instrument, connect your speakers, hook up your computer, and get making music. Komplete Audio 1 and 2 offer pristine audio quality with all the software you need to produce a finished track. Whether you're a singer/songwriter, producer, keyboard player, composer, DJ, live performer or podcaster, Komplete Audio 1 is the perfect bridge between your creativity and your computer. When you're ready to take control of your music, a keyboard controller is an essential purchase. Control your software instruments, tap in beats, control MIDI parameters, and own your production. The Komplete Kontrol M32 is the most compact keyboard controller yet from Native Instruments. Wherever you are, pack your M32 and you'll be able to sketch, tweak, mix and more with this 32-key powerhouse. Portable, playable, the M32 gives you the perfect control over your Native Instruments production. Anyone can get mixing tracks with Traktor DJ 2. This app is built for desktop or iPad, and allows you to hone your skills, apply creative tools, and most importantly, share your music. Mix anywhere with an intuitive workflow and search through an endless record collection via SoundCloud Go integration. When you're ready to get hands on with your DJ'ing, get the Traktor Kontrol S2 MK3 and join the world of club layout devices. The Traktor Kontrol S2 comes complete with Traktor Pro 3.1.0, jam-packed with new features for 2019. Looking for ready-made loops and samples to spark your creativity? Welcome to Sounds.com. Featuring over one million royalty-free loops and samples, you'll find the exact one-shots or beats you need. Sounds.com now features 200 curated Collections and new sound packs by leading producers and artists. Sounds.com can be integrated directly with Komplete Kontrol and Maschine, letting you get inspired from directly inside your NI ecosystem. Komplete Kontrol is the ultimate hub for instruments, effects, presets, controller mappings, loops and samples. When your library grows, Komplete Kontrol is the perfect organisational tool to keep your sounds in check. The latest version of Komplete Kontrol features a built-in sampler, works with any hardware controller, and can sync your Sounds.com collections with a single click! Get it free with Komplete Start. Maschine 2.8 is an intuitive beat-making system designed to get you making music fast. The latest version 2.8 provides direct access to all your loops and samples, as well as unparalleled inspiration via direct integration with Sounds.com. All the latest Native Instruments hardware comes complete with Maschine Essentials; featuring the full Maschine software plus a 1.6 GB selection of kits, sounds, and samples for any genre of music. Native Instruments is a complete ecosystem of hardware and software, designed to empower your musical creation, no matter what your genre. With premium software, controllers, and audio interfaces, Native Instruments has something for everyone. 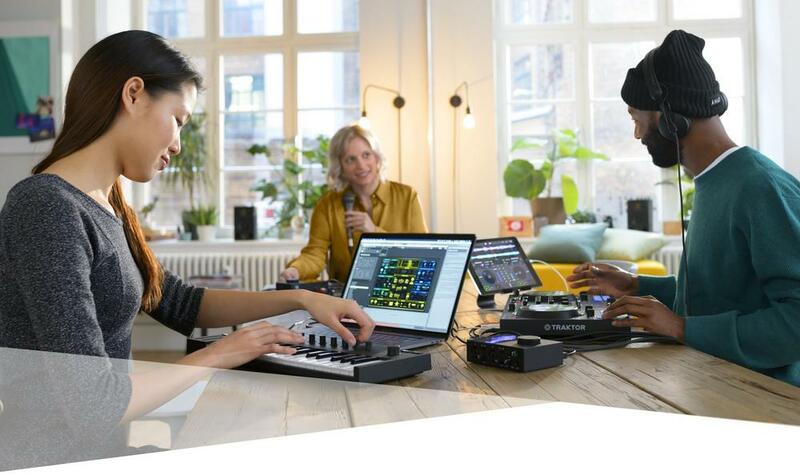 From beatmakers to producers, DJs to live performers, songwriters to podcasters, you'll find exactly what you need in the Native Instruments family. Whether you're just beginning your journey or you're a seasoned pro, find out how NI can take your productions to the next level. Omnisphere 2.6 is Here. New Updates Include Expanded Hardware Integration, New Creative Tools, and Much More. Omnisphere has been updated to version 2.6. This flagship software now features even more creative tools and support for over 65 hardware synths! The brand-new Grand from Nord is a stage piano with a hammer action keyboard from Kawai. Redefine your expectations of what a stage piano can do! WIN ADAM Audio Studio Monitors and More! ADAM Audio is 20 years old! To celebrate, you can win a set of studio monitors plus more prizes! Find out how to enter before 31st March. The Native Instruments KOMPLETE AUDIO 1 and AUDIO 2 are here! Looking for an easy and affordable way of producing music and podcasts? Join the premium Native Instruments family with the KOMPLETE AUDIO 1 and AUDIO 2 audio interfaces. The Native Instruments KOMPLETE KONTROL M32 is Here! Calling all musicians on the go! Get your hands on the smallest keyboard yet from Native Instruments. The M32 is in stock now. A headphone amplifier is an essential tool for audio recording and live sound. Here's five reasons you need one in your life. Here at Gear4music we have a great relationship with Zildjian Cymbals and this year we were lucky enough to be invited to the factory and headquarters over in Norwell, Massachusetts, USA. The flagship Boss GT-1000 has a free Firmware update which brings brand-new functionality to bass players. The new HeadRush Looperboard offers both looping and creative tools, making it more akin to a complete production device in a box. Welcome to the future of looping performance. COMPETITION EXTENDED for 24 HOURS! Win a Shure Microphone Worth Nearly 200 GBP! Have you entered yet? Win a MV88+ Video Kit from Shure, worth nearly £200! Competition closes Tuesday 16th April, so don't miss out. The 2019 Record Store Day is a collaboration of over 200 independent record shops across the UK on the 13th April. To celebrate, we've put together some fantastic bundles to get you started on your vinyl journey. Native Instruments | For the Music in You. Music Production in 2019.